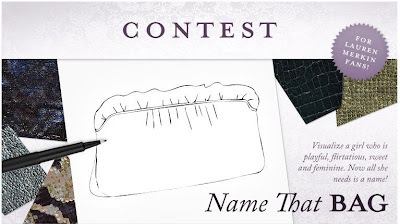 Lauren Merkin has launched a Facebook contest called Name That Bag. She is giving her Facebook fans the chance to name a clutch from her upcoming Holiday 2010 Collection. 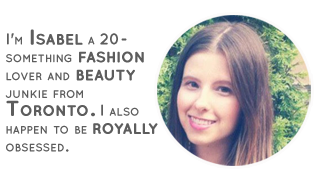 Lauren Merkin asks that you think of a girl who is playful, flirtatious, sweet, and feminine and give her a name. The winners name of choice will be used to name the bag and the winner will recieve the Holiday 2010 clutch as well. I have already entered the contest...guess what I named the bag? If you want to enter go to Lauren Merkin's Facebook page. Lauren Merkin has also recently released her Spring 2010 Collection, which is now available at boutiques, department stores, and online retailers as well as LaurenMerkin.com. I have fallen hard for her spring clutches. They are gorgeous bright colours that are perfect for adding fun and colour to your wardrobe. The shapes are classic and won't ever go out of style. Here is the Tatum in painted blue and yellow serpent skin. I think the colours are beautiful and I would love to carry this for a night out with my friends or to dinner with my boyfriend. Here is the Lucy in green stingray skin with rainbow zipper trim. The rainbow zipper trim made my heart skip a beat. Here is the Ava in black textured snakeskin. This is a great classic piece to add to your collection and the zipper trim adds some fun to the classic look. Here is the Allie in pink stingray skin with rainbow zipper trim. I love the hot pink which I think is perfectly complimented by rainbow zipper trim. Pair this with a little black dress and you are good to go! Here is the Cecilia in black textured snakeskin. This is my favourites of the bags. I love the braided strap, which gives the bag a great boho feel. I also love the look of the textured snakeskin and I think that the shape makes the Cecilia a great functional cross body. Here is the Bella Tote in a glossy black. This is quite a classic and functional shape that can be used as an everyday bag. I think the studs give it a bit of edge and add a bit more fun to the bag. Check LaurenMerkin.com for prices and colours. They are so cute! I don't own a single clutch, but this entry certainly makes me want to! I adore that Lauren Merkin bag. I've been searching for the perfect canary yellow clutch, but that one is way more fun than solid yellow! All those bags are so beautiful! I think I'd like to get them in my hands. I love all of them! They are great! I've posted something new! so you can check it! My favorite is Tatum, love the colors! such a cool contest. and love the braided strap. the first two clutches are really cool. (: sweet post. that's such a great competition ! i think i'll try my luck there !